NASA astronaut Cady Coleman (right) and Italian astronaut Paolo Nespoli proudly display the newest resident of the International Space Station, the humanoid Robonaut 2 robot, to cameras on March 15, 2011. This story was updated at 5:30 p.m. EDT. A NASA space robot got its first taste of freedom in months today (March 15), when astronauts aboard the International Space Station finally pried open its packing crate. Astronauts Cady Coleman and Paolo Nespoli set free Robonaut 2 — a prototype robotic assistant designed to help astronaut crews with chores and repairs — at around 5 p.m. EDT (2100 GMT) today. 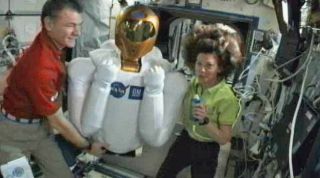 The robot butler, which arrived at the station aboard NASA's space shuttle Discovery on Feb. 26, had been packed away in a closet-size crate since August 2010. "Totally awesome," a voice answered from NASA mission control in Houston. "Thanks for that, guys." Coleman and Nespoli played a bit of a joke on the viewers watching NASA's video feed. The spaceflyers announced that they had a shock when they opened the space robot's crate. "It looks like Robonaut is not here," Nespoli said. "We just have an empty box where Robonaut is supposed to be," Coleman added. But eventually the camera found Robonaut 2 floating by himself in the station, and Coleman swooped in to greet and grab ahold of the robotic helper. "Robonaut is aboard, and he couldn't wait for us to get him out of the box," Coleman joked. Robonaut 2 will eventually be put to work doing some chores aboard the station. But that will come later. The first order of business is giving the robot a quick going-over, to make sure it survived the trip from Earth in good shape. "They'll do an inspection to make sure it all looks good, that there was no damage during launch," said NASA spokeswoman Brandi Dean at the agency's Johnson Space Center in Houston. Robonaut 2 is also making appearances in the U.S. Capitol this week. Today, a ground-based version of the robot will meet members of Congress as part of a NASA technology exhibit for lawmakers at the Capitol Visitor Center. On Wednesday (March 16), the ground twin of Robonaut 2 will make another appearance, this time at the "Moving Beyond Earth" gallery in the Smithsonian's National Air and Space Museum. Museum officials and NASA will give live demonstrations of Robonaut 2 throughout the day tomorrow. Astronaut Paolo Nespoli writes, "Robonaut in its crate gets moved from PMM to the Lab. We’ll unpack it later, unless it takes over the ISS earlier!" R2 is a joint project of NASA and carmaker General Motors. It's the product of a cooperative agreement to develop a robotic helper that can work alongside humans, whether they're astronauts in space or Earthbound workers at GM plants, NASA officials have said. The real-life R2 unit (whose name bears a resemblance to the R2D2 droid of "Star Wars" fame) will live and work at a post inside the space station's Destiny module. With its dexterity, the robot should be able to use many of the same tools astronauts do. Researchers will study how R2 works side-by-side with astronauts to make station operations run more smoothly. The overall goal is to use lessons learned from R2 to develop more advanced robotic helpers in the future, according to NASA officials. R2's working life won't be starting in the next few days. After inspecting the bot, astronauts will stow it temporarily, Dean said. The robot's packing foam and crate will be packed away inside the station's unmanned Japanese HTV-2 cargo vehicle, which will take garbage away from the station later this month, ultimately burning up in Earth's atmosphere. At some point in the not-too-distant future, R2 will get to flex its arms and fingers in space for the first time. Astronauts will slide a so-called "task board" in front of the bot, letting it practice pushing buttons and flipping switches. But when that will happen remains up in the air. "As far as I know, there's no schedule for that yet," Dean told SPACE.com. R2's first moments of freedom in space may be a frustratingly brief tease, for the robot will be shelved for a while shortly after the astronauts finish looking it over. "They'll put Robonaut 2 in a bag to protect it, once they've taken it out and inspected it," Dean said.